First and foremost in our minds is the subject of safety. We work in an inherently dangerous environment where permanent injury is a serious and ever-present reality. Our methods have been developed from many years of experience and they work. Since opening the school in 2001, we have had no serious student injuries. We will teach you unique and repeatable methods to be safe here in our shop and in your own. We will explain the theory behind our methods and why they are the safest possible. As professional woodworkers, we do this for a living rather than just teaching it. Our approach to woodworking is heavily machine oriented. We aim to get the job done in the fastest, most efficient, and practical means possible. This does not mean that one needs to spend tens of thousands of dollars to equip a shop. We will spend plenty of time in class talking about the most affordable and smartest way to equip your tool collection on a given budget. Every shop needs hand tools and we use these traditional tools every day in our regular studio work. However, we believe very strongly that we have modern technology available to us and it seems counter productive to not take advantage of it. Yes, it is true that one is able to start a fire with the ancient method of friction using a bow, a cord, a dowel, and a lot of physical exhaustion. We can also start the same fire by striking a match to produce the same result in seconds. We live in the machine age, we honor the past, but do not chose to relive it. In each class, the daily mix consists of intensive lecture, demonstration, and then student practice activities. Lecture periods are interactive, informative, and intensive but are a fun educational experience. Generally, we demonstrate joinery in a multitude of ways to achieve the same results. You can modify the process to fit the tooling you’ll have access to when you leave us. For example, a joinery process is first demonstrated with the use of hand tools. Next the same joint or procedure is done with a simple hand held power tool, such as the router. Then, the process is demonstrated with stationary equipment such as the table saw, drill press, and mortiser. Students choose whatever production method works best for them and how they either plan to equip their workshop and/or work around their existing home tooling. Our class focuses as much on the material as our methods of working it. Wood is an extremely unique material, but it can be predictable if you know how to read the grain. Many students remark that they will never look at wood the same again. 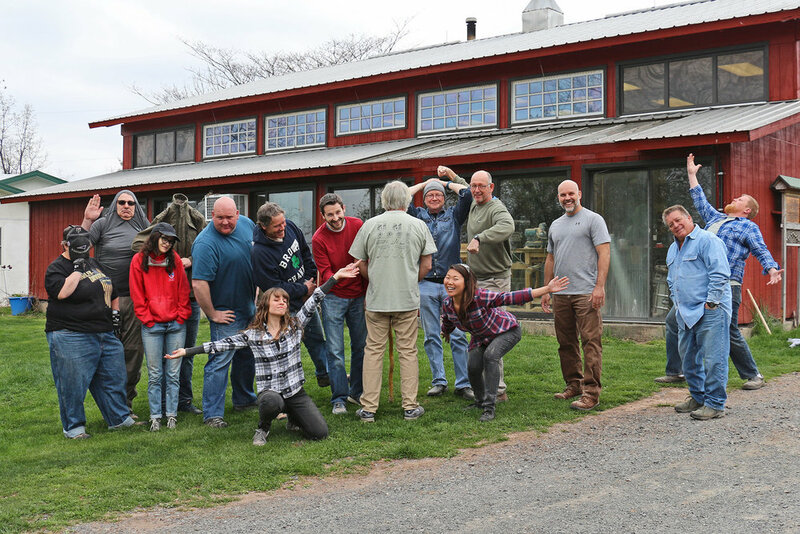 The alumni of the Lohr School of Woodworking come from many backgrounds. What unites us all is a passion in working with wood and a desire to reach our fullest potential. All are welcome in our woodshop! Many of our students are nearing retirement and looking for a hobby to inspire themselves in their next chapter. Others are young people, searching for a glimpse at a unique and rewarding career in woodworking. Some are working adults looking to hone their weekend warrior woodworking skills so they can step out from behind their computer desks. We have hosted men and women from across the United States and international students from the UK, France, South America, Turkey, India, and Africa. The skill level of our students is quite variable. Some of our students are complete beginners, while we've also hosted professional cabinetmakers that never had formal training. No matter your skill set, we promise there is a lot to be learned at the Lohr School of Woodworking. The camaraderie that we experience with each class is truly what makes this such a wonderful learning environment. Students from varying skill levels, age groups, and backgrounds all help one another open their eyes to new ideas, methods, and techniques. Many students have kept in touch over the years, forming their own clubs, sharing ideas, and helping each other out long after the class has ended.